For over a decade, Mosaic Moments™ has been a great page layout system for creating beautiful scrapbook pages and photo collages. 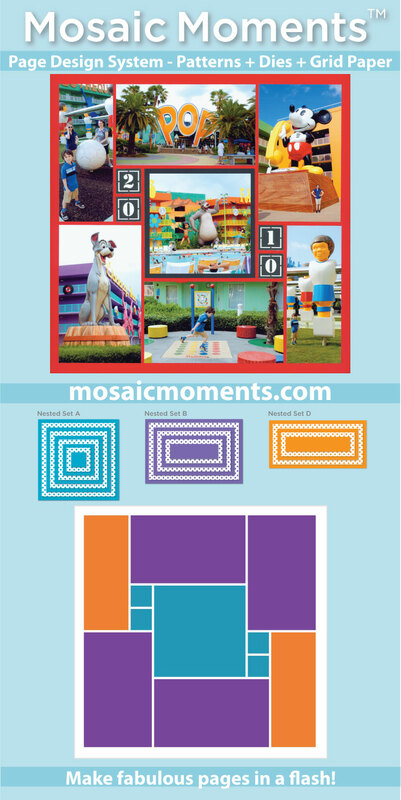 With the introduction of Mosaic Moments™ dies it has also become the fastest and most flexible scrapbook design system available. As you explore our site please be sure to visit our FREE Pattern Gallery – we add new designs to this regularly. Note that Mosaic Moments™ Dies are each assigned a color. We use this color on our patterns to let you know at a glance which dies will be used to create each page.